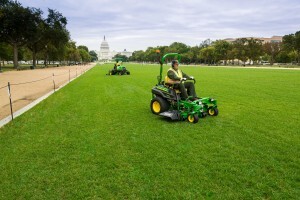 John Deere donated $400,000 in equipment to the National Park Service to restore the National Mall. Photo: John Deere. 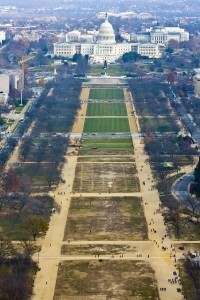 Glance at the National Mall from an aerial view and one might notice a divide in the grounds—a lush greenery on the east side in front of the U.S. Capitol building and a lawn in need of a facelift on the west side in front of the Washington Monument. That unbalance will soon come to an end. John Deere donated $400,000 in equipment to the National Park Service (NPS) to maintain the restored areas of the National Mall (from 3rd and 7th Street) and to migrate that restoration west (from 7th to 10th Street). The renewal of the latter side of the mall will begin next week, at the start of the 2014 fiscal year. In an early celebration of National Public Lands Day, John Deere personnel as well as representatives from the Trust for the National Mall and NPS gathered at the National Mall Sept. 27 to unveil the donation. X739 lawn tractor, snow blower and other attachments. John Deere equipment was used to restore the east end of the National Mall. Photo: John Deere. John Deere’s partnership with the NPS, Caldwell said, has been in the works for around 10 months and goes hand-in-hand with the National Mall plan. Instated in November 2010 the plan was set in place to revive and continually sustain the National Mall, making it functional for nearly 30 million visitors per year. Caroline Cunningham, president of the Trust for the National Mall, added the space also hosts 3,000 permitted events annually. Prior to the National Mall plan it had been around 40 years since the space received renovations, said Jon Jarvis, NPS director. Public-private partnerships, he said, have proven to be effective ways to restore the Mall, especially in rough economic times.